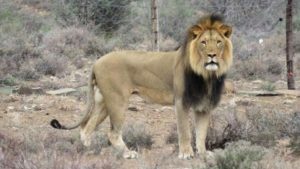 A team of rangers, trackers and volunteers are still searching for a lion which escaped from the Karoo National Park near Beaufort West last week. The animal is thought to have dug his way out from under a fence following the recent heavy rains in the area. This is the second lion to have escaped from the park in recent years. In 2016, Sylvester made headlines when he got out twice. On Tuesday, rangers found an eland carcass on a farm adjacent to the park. Residents of Beaufort West are living in fear, especially due to the number of escapes. Park authorities say the lion is nowhere near the town as it is being tracked in rough, mountainous terrain. Van der Walt has urged residents to remain cautious. Park officials are positive that they will track down the feline shortly. The post Search still on for Karoo National Park lion appeared first on SABC News – Breaking news, special reports, world, business, sport coverage of all South African current events. Africa's news leader..